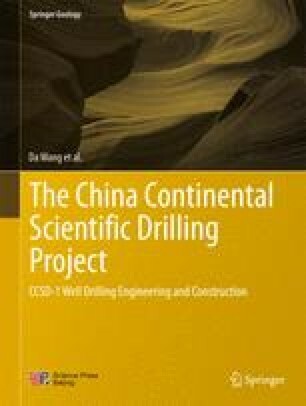 As a huge systems engineering project, China Continental Scientific Drilling (CCSD) engineering project consisted of five main sub-projects and one subsidiary sub-project. The five main sub-projects included drilling sub-project, borehole geology and analysis and test sub-project, borehole logging sub-project, geophysics sub-project and information sub-project; while the subsidiary sub-project denoted civil engineering. Among these sub-projects, drilling sub-project was the key, which was the precondition of conducting other sub-projects. Only by obtaining core, rock samples, gas and fluid samples through drilling project could analysis and test sub-project be started and only after borehole completed that a passageway could be available for logging and for geophysical tests, so as to obtain the underground material information. Besides, drilling sub-project was the one which cost the largest investment and the longest time, and with extreme difficulty. Therefore the successful completion of drilling sub-project determined the success of the whole scientific drilling engineering project.